Flowers from the garden are a constant source of inspiration for me. 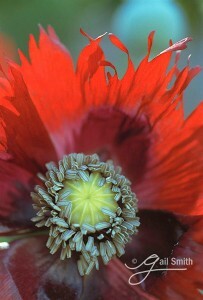 About six years ago I planted Papaver somniferum seeds that I had purchased from Nichols Garden nursery in Oregon. They bloomed a brilliant red. I was very happy with the backlit photograph I made of one of the blooms. This past spring I discovered a new group of volunteer poppies bursting through the soil’s surface! Recognizing the silvery grey foliage of the poppy, I made sure not to pick the volunteers so that I’d have the flowers to enjoy (photograph) later. 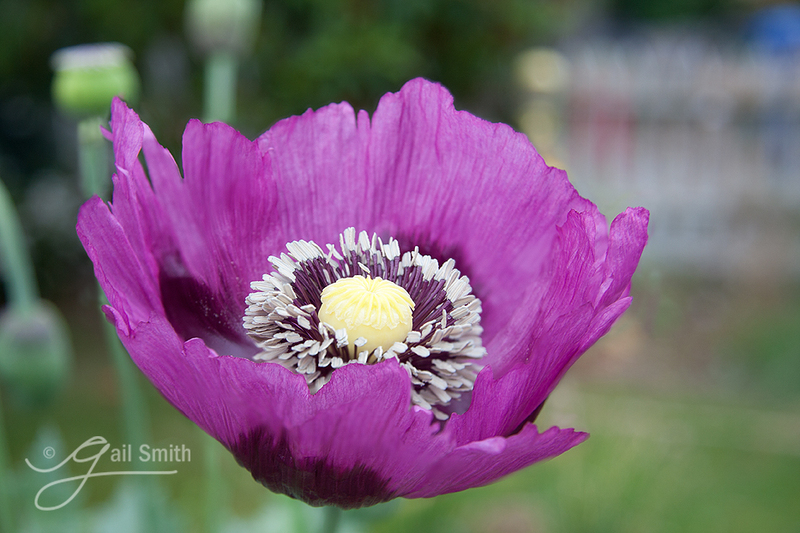 When the poppies finally bloomed in early August, I was surprised to see purple flowers lined up in the bed. I had to photograph them! My goal was to capture an entire purple bloom in sharp focus, using a large lens aperture to maintain a shallow depth of field. Even with the slightest breeze the flowers were in constant motion. It was impossible to show the whole bloom in focus with one exposure. I decided to use Photoshop to help me create a sharp photograph. I made four exposures in a row, very quickly. With each exposure I changed the area of focus slightly, gradually moving my focus from the closest part of the petals, to the petals at the back of the flower. Then, using Adobe Photoshop, I layered the exposures one on top of the other in the order that I shot them: the second exposure sitting ‘on top’ of the first, the third on top of the second and so forth. 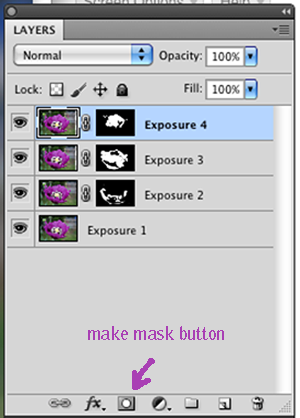 I gave each layer a mask by clicking on the ‘mask’ button at the bottom of the layers palette. I filled each mask with black and carefully revealed the parts of each layer that are in focus by painting over the black with a white brush, to reveal the portions I wanted to show. 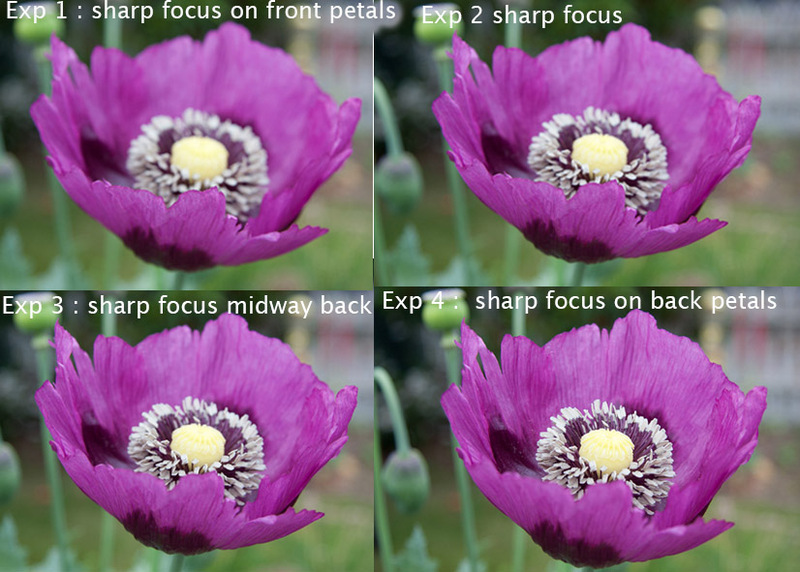 Following this formula with each exposure, I soon had a single, sharply focused photograph of the volunteer poppy! The fact that the backgrounds were different in the four photographs was not a problem. The only background visible was the one in the first exposure. I saved the layered file to archive, flattened the file and saved a small version as a jpg to upload here. The next time you find yourself without a tripod, or too close to get the depth of field you want with your lens, shoot multiple exposures of your subject in quick succession, changing only the focal point from foreground to background as you go. Try piecing the different files together using layers and masks! Masks and layers can be your friends! Questions about using masks or layers in Adobe Photoshop? 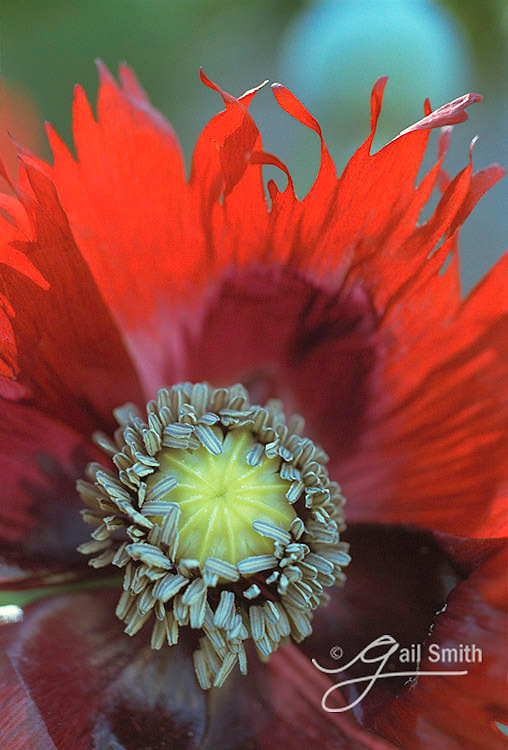 This entry was posted in Beauty of the Natural World, Photoshop Tips and tagged gardening, horticulture, Papaver somniferum, photography.